Husband took this photo. It shows the masses of little flowers that make up this marvellous spike. The insects and native bees were working over the flowers when he took me to see it. I downloaded his photos to my computer as they were really good shots. 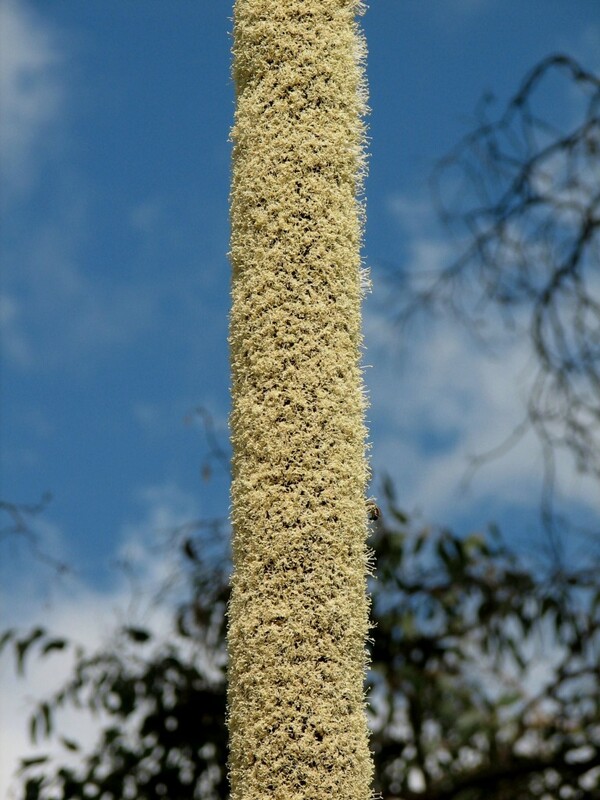 I found my small plant of this Grass Tree today. I raised a few from seed and this one must be 5 years old. It is about 30cm tall and is a tuft about the thickness of two adult fingers. Considering that it normally occurs in deep slightly acid sand, in an area of 500-600mm rainfall I guess it is not a bad size. We saw one about 10 years old in a garden and it had a flower spike. Gorgeous Corinne. Both this flower and your previous photo. They just shout Australia don’t they! could you tell me anything about raising a grass tree from seed? A friend will be giving me some in the next few months and would love some info. How did you do it? The plant your husband saw may be Doryanthus excelsa (Gymea Lily). (I Have never heard it referred to as flaming spear. It may be in some locations.) It has large red flowers in globular clusters to 35cm across on stems 2-4m tall, in Spring and summer. It is indigenous to Australia, and can be grown from seed which is usually available from a few seed companies.